Discussions of rural America often summon images of pastoral farmland, country roads, and close-knit communities; this vision offers a sharp contrast to contemporary perspectives of rural America, which highlight unemployment, entrenched poverty, economic decline, and geophysical isolation. However, both narratives share one characteristic: the belief that a high-quality education can open a world of opportunities for rural children. This chapter fills an existing gap in research by documenting successful practices of digital learning to support students, teachers, and families in rural education settings. A qualitative study identified the challenges faced by rural schools and then explored the digital learning strategies used to meet these challenges. Across the country, innovative practitioners are expanding Internet access, addressing teacher shortages, and increasing course offerings, which has in turn contributed to the academic achievement and future prosperity of today's rural students. The first step in understanding rural education and the implications of leveraging digital technology to support improved student outcomes in this area is to develop a working definition of rural and what characterizes rural regions. The U.S. Census Bureau (2010) defines rural as “any population, housing, or territory” (p. 1) not included within one of the nation’s identified urban areas of 50,000 people or more or the nation’s urban clusters of 2,500 to 50,000 people. Using this urban-centric calculation, a clear dichotomy emerges; rurality as examined by geographical area differs greatly from rurality as defined by population. While rural areas cover 97% of the nation’s land area, they contain less than 20% of the population (U.S. Census Bureau, 2016). While the tendency is to think of the rural land areas such as the mountains and deserts of the western U.S. and or the plains of the Midwest, as demonstrated in Figure 1, most of the nation’s approximately 60-million-person rural population tends to live outside the fringes of cities. This is particularly notable in the southern part of the country and east of the Mississippi River. Where people live in rural areas. The concentration of rural populations tends to be around urban centers. Image use by permission of the Foundation for Blended and Online Learning. Throughout the chapter, we have relied on education locale codes generated by the National Center for Education Statistics (NCES), which align with the U.S. Census Bureau’s classifications. These locale codes and their definitions are replicated below as Figure 2. Some school and district strategies shared in this study occurred in what are technically NCES town locales; however, if these schools or districts served a significant number of rural students, their stories were included. Of the U.S. rural student population, roughly 60% are in fringe-rural schools, 30% are in distant rural areas, and 10% are considered remote (FBOL, 2018, p. 8). NCES locale designations following the U.S. Census Bureau's urban-centric definition of rurality. Image use by permission of the Foundation for Blended and Online Learning. Online School: An online school, as defined for the purposes of this research, is a school that delivers all core course content in a digital format. While the online school may have a brick-and-mortar campus, and students may attend supplemental lab times or tutoring at this site, the vast majority of a student’s learning experience in this model occurs online and asynchronously. 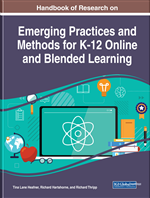 Blended Learning: The widely agreed-upon definition of blended learning originates with Michael B. Horn and Heather Staker’s 2014 book Blended: Using Disruptive Innovation to Improve Schools . Blended learning is defined as a formal education program in which a student learns at least in part through online learning and at least in part in a supervised brick-and-mortar location away from home, with some element of student control over time, place, path, and/or pace of learning. Key to the concept of blended learning is that the online and face-to-face modalities along the learning pathway are designed to provide a cohesive learning experience for the student. Digital Learning: Digital learning encompasses instructional practices that use digital technology to strengthen or augment a student’s learning experience. Use of the term here is broad and not limited to online and blended; it is inclusive of instructional content, data and assessment systems, learning platforms, online courses, adaptive software, and personal learning technologies. Education Technology: The term education technology, popularly known as “edtech,” is used here to encompass the widely diverse use of computing and mobile devices, online tools, platforms, and resources, and other types of classroom-level technologies that do not fit the above definitions of online learning or blended learning. This term is often used in reference to schools or districts that have implemented technology-rich and/or personalized learning environments. Online Learning: Online learning is instruction and content delivered primarily over the Internet, sometimes accompanied by some additional communication and/or assistance by phone or video conferencing. A single course or an entire school may be online. Virtual learning, cyber learning, distance learning, and e-learning are all used here as synonyms. State Virtual School: State virtual schools are programs that are administered and/or funded by a state to provide online learning opportunities within that state. Such programs have the capacity to offer supplemental online courses to students throughout the state. State virtual schools are often created by legislation or by a state-level agency, and receive state appropriation or grant funding. They also may charge course fees to help cover the costs of administering online programming and courses. The programs may be administered by a state education agency, but could also be 501(c)(3) nonprofits, charter schools, or organizations contracted to operate the state virtual school by the state education agency. Technology-Enriched Environment: More schools are integrating technology or some form of digital learning into the traditional classroom structure. These schools maintain a traditional school week on a brick-and-mortar campus and face-to-face instruction is still the predominant instructional modality. Adding educational technology tools that adapt to students’ mastery levels, allow teachers to track student progress, and support more effective classroom instruction is increasingly common as more schools move to 1:1 device initiatives. The terms technology integration, technology enhanced, and technology-rich are all used to describe these levels of tech adoption that have not yet moved to a true blended learning experience. Blended or Hybrid School: The terms blended learning and hybrid learning are often used interchangeably. In general, a school using a hybrid or blended learning model is designed such that formal “live-taught” instructional components support, enhance, and extend the digital learning curriculum. The experience from the student perspective is a “blend” of the flexibility and individualization afforded by technology and the hands-on practice and application of concepts afforded by face-to-face instruction. Blended or hybrid schools often have unique scheduling and/or staffing structures; for example, students may be required to attend campus two days a week or some other nontraditional schedule.